“We had no food, no work and ended up with no home; my house was totally destroyed by the rain, that’s when I had to leave with my five-year-old and six-month-old children. I had to leave my nine-year-old son behind as I couldn’t afford the bus ticket for the four of us.” Amel is a South Sudanese from Gok Mashar who is now in Kario Camp, in Sudan’s East Darfur. Kario camp reception centre is the first stop for South Sudanese newcomers waiting to be accommodated in Kario Camp. The camp registration unit receives refugees every day, most of them from South Sudan. The MSF mobile team goes there twice a week to assess the health conditions of the new arrivals: vaccination, malnutrition screening and referral to the MSF facility in Kario are provided. The violence and conflict in South Sudan have displaced millions, with roughly one third of the population having fled their homes. In East Darfur, many had left Sudan for South Sudan after 2011 independence, but are now forced to go back as a result of the ongoing conflict. Currently there are more than 750,000 South Sudanese refugees in Sudan according to UNHCR. Around 100,000 of them are in East Darfur, where MSF set up its hospital in July 2017 in Kario camp. The camp is the biggest refugee settlement in East Darfur, and today hosts around 20,000 refugees. The living conditions in Kario camp are worrying. People don’t have enough food, and this is particularly impacting children, and pregnant and lactating mothers. If this continues, there is a high probability that severe malnutrition cases will increase, particularly at the start of the lean season, between May and October. Zakria continues: “We also treat many cases of neonatal sepsis, a bacterial blood infection in a newborn baby, and puerperal sepsis, which is a genital infection that happens during labour or after. This happens because many deliveries occur at home without the proper hygienic conditions. We need to work more on health education in the camp and in the local community”. Mou Dut Achuil, MSF nurse assistant, doing ACT Malaria test for 3 years old boy. 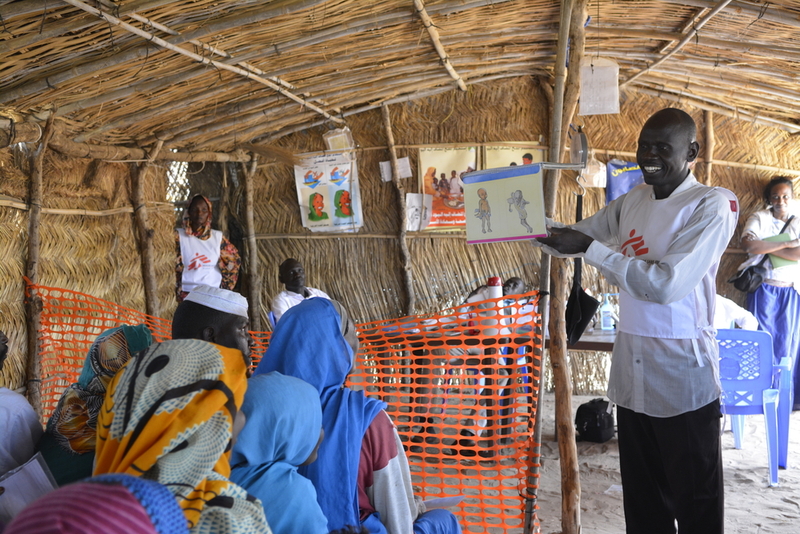 Ibrahim Korina, a Sudanese community leader in the Kario administrative unit, and one of the representatives of the community, was asked about MSF’s services in Kario camp, and he said: “MSF’s health services are available and accessible to both refugees and locals in Kario. MSF’s presence in this region is essential for the prevention of, and the response to, the health needs of the population”. MSF started its intervention in Kario in July 2017, during the Acute Watery Diarrhoea (AWD) outbreak. MSF immediately opened and ran AWD treatment centres with 20 beds, until the number of cases declined. 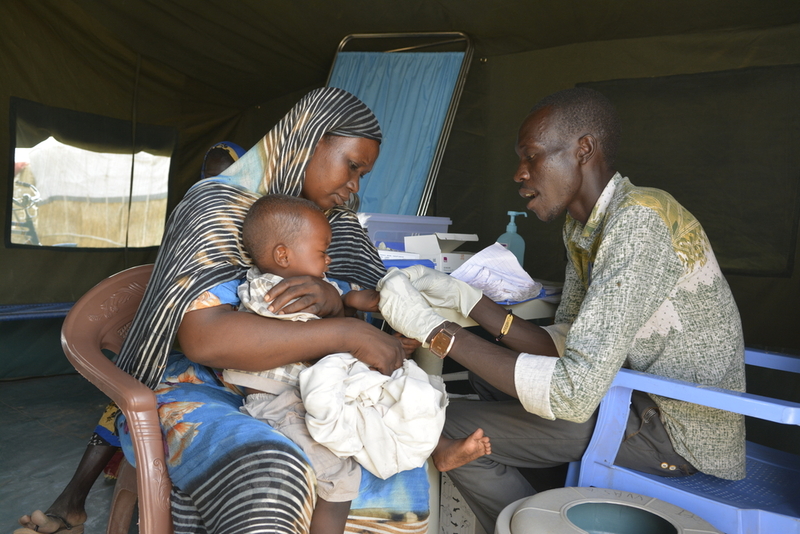 Meanwhile, MSF upgraded Kario Health Centre into a hospital, providing free primary and secondary health care services, including maternity, nutrition and vaccination programs to almost 40,000 people living in the area. Antony, MSF’s health promoter, is giving a session about the importance of breastfeeding to patients in the waiting area. The health facility receives between 200 and 300 consultations per day in the outpatient department, and they include both refugees and members of the host community. The inpatient department has 20 beds and emergency cases are referred to Ed-Daein City Hospital. Dar Alnaeem, 20 years old, lives in Kario village. She says: “In the past, we used to deliver babies at home with the assistance of a traditional midwife from our community, because there was no health centre available in the area. When I knew about the opening of a maternity unit in the MSF centre, I decided to deliver here, it’s safer. After the delivery I was under observation with my baby for 24 hours, that’s how we discovered that he needs to be kept in the centre for follow up”. Since the AWD outbreak took place last year, prevention is one of MSF’s main concerns. “At least when we are present here we can detect any possible outbreak and quickly apply the necessary measures to prevent further transmissions and possible outbreaks,” said Vanessa. 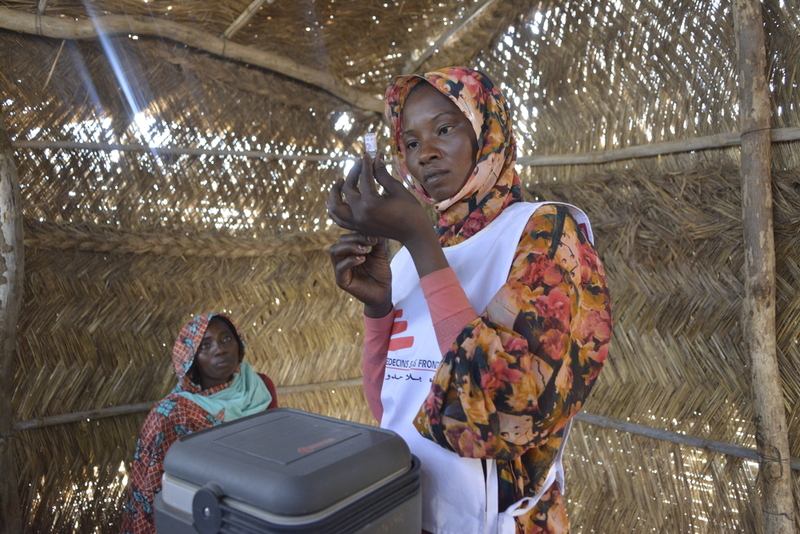 In the vaccination room of MSF Health Centre in Kario camp, Samia is doing vaccinations for women and children. 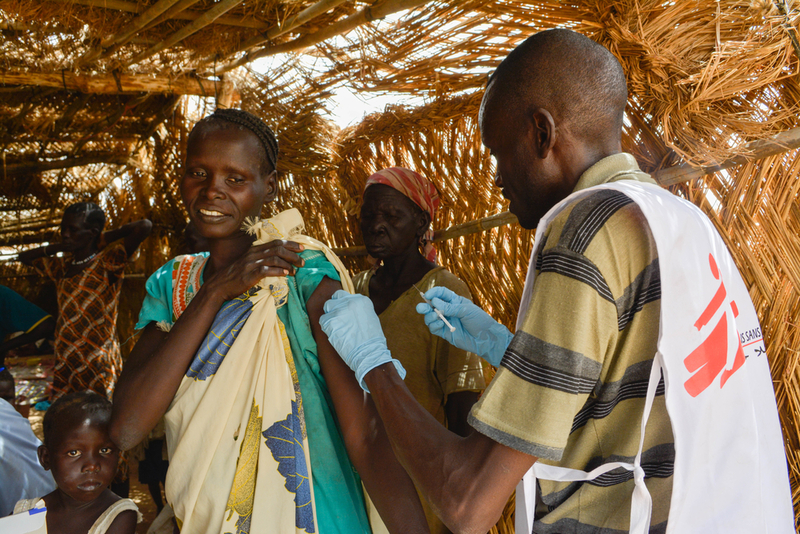 In December, MSF vaccinated 19,000 children against measles during a one-week immunization campaign. On a daily basis, a team of 25 community workers walks in the camp and provides health prevention messages. MSF Kario hospital is improving and expanding its health services to meet the needs of the increasing number of patients. But despite the improved access to healthcare, living conditions for people in the camp remain dire. There are some concerns about the extent to which basic needs like food, latrines, water, sanitation, and suitable shelters are met. Especially in the reception centre, the dehumanizing living conditions are impacting on people’s mental health. That is why other humanitarian actors should improve the quality of their services, and ensure proper monitoring mechanisms are in place to evaluate the activities and their impact. Currently, aid delivered in Kario is far below humanitarian standards.